The Great Migration is a natural spectacle like nothing else on the planet. It’s hard to imagine a phenomenon of that breathtaking scale; one just have to see it. My last visit to Masai Mara as a skipper for ‘The Great Migration’ photography tour for Toehold is an experience etched in my memory. The very first evening in the Savanna proved to be an overwhelming experience as we saw a beautiful lioness sitting by a thicket. Her hues were in contrast with her surroundings, which made the sighting a great photo opportunity as well. A while later, we saw the lioness mating with a handsome lion. The next morning, as we journeyed into the expanse of the Mara plains, we saw a lion with its wildebeest kill. During the Great Migration Tour, death is a constant feature we witness. The place is teeming with bountiful prey and predators and we must only be fortunate to see the wildlife in action. The significance of seeing a black rhino in Masai Mara is beyond words. Especially so because it is critically endangered. Like a fitting end to our amazing day, the sunset was spectacular with its fiery colours. That’s another great thing about the place – the light is almost always great and the sunsets and sunrises are breathtaking day after day. Next day, we were besotted with a cheetah relaxing in the grassland. She later moved up a mound to join her small cub. They both sat in languor there and we had a great time watching and photographing them. We were fortunate to see the migration happen right before our eyes. 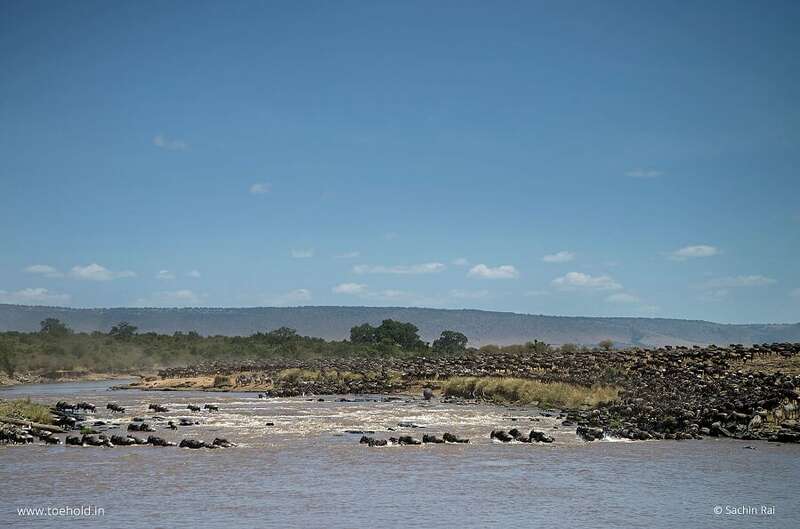 Hundreds of wildebeests began crossing the river. It’s not always guaranteed to witness natural moving grandeur of this scale but there we were, muted by the magnificence of it, the massiveness of it. The wildebeests, which become prey to the lions and cheetahs and leopards and hyenas as they migrate, cross the river heroically. It’s a rather moving thing to see. 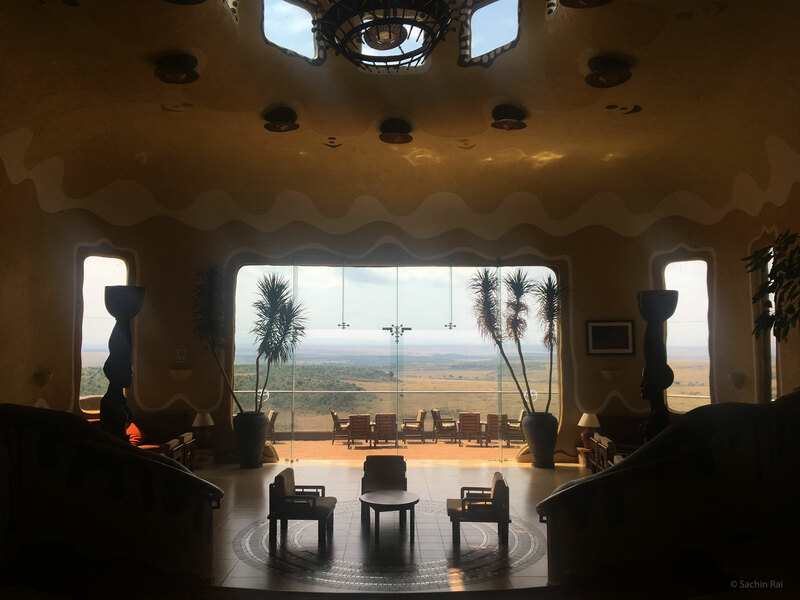 Whenever I’m in Kenya, with the participants of our Toehold photography tours, I love introducing them to the cultural aspects of the place as well. And meeting the Masai tribe is one such humbling, priceless experience. The Masai people are the very symbol of this part of the African land. Their unique mud houses, their way of dressing in robes, their bold accessories and jewellery, their exotic ethnicity – all these details add richness to our experiences as travellers and photographers. Capturing the Masai folks in enchanting portraits is a joy. The following day, we saw a sombre-looking quiet baboon, another cheetah and a pair of lions. Kenya always promises great light, great subjects for photography and visceral experiences season after season. When Africa calls, there’s no negotiation. One simply flies across the oceans to set foot in that ancient part of the planet. The travel is either by Emirates or by Kenya Airways. This article appeared in Metrolife-Deccan Herald on 24 May 2018.